The current research in Wang Lab focuses on intestinal tissue engineering and intestinal regenerative medicine based on intestinal stem cells. As PI or co-Investigator on several university- and foundation-funded grants, Dr. Wang laid the groundwork for the proposed research by developing collagen I based gels for the culture of primary intestinal stem cells and use collagen I foams as cell carriers for the delivery of intestinal stem cells , and by demonstrating the feasibility to encapsulate DNA-functionalized gold nanoparticles into primary isolated intestinal stem cells to form an intestinal Trojan horse for gene regulation therapy of inflammatory bowel disease . Dr. Wang is aware the current major non-genetic cell engineering strategies for drug delivery and cell-based therapies [3, 4]. 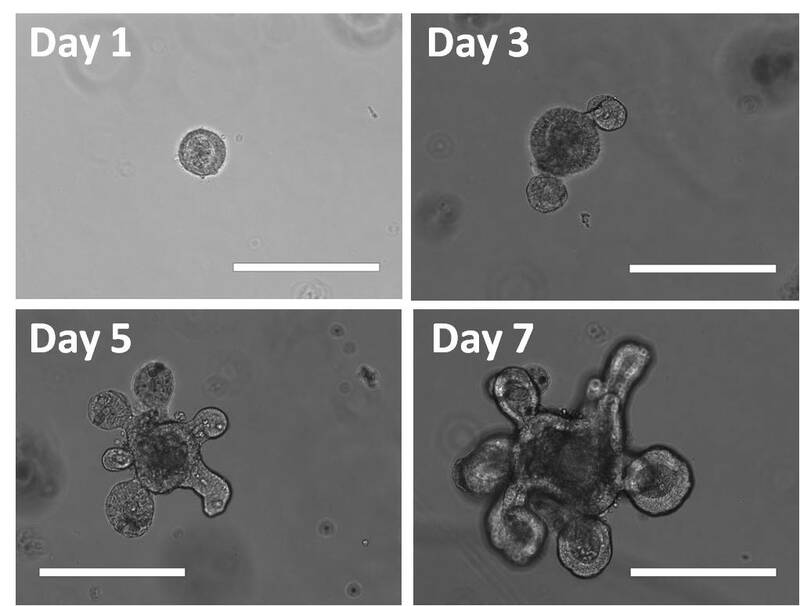 The morphology of intestinal stem cells cultured in Matrigel during 7 days. The scale bars were 200 μm . 1) Peng H, Poovaiah N, Forrester M, Cochran E, Wang Q. Ex vivo culture of primary intestinal stem cells in collagen gels and foams. ACS Biomaterials Science & Engineering. 2015; 1(1):37-42.